Gaudí’s Basilica of Sagrada Familia in Barcelona must be one of the best-known churches in the world. But Barcelona has many other fine churches, including the city’s fine 13th-15th century gothic cathedral in the Barri Gòtic or Gothic Quarter in the old city, and a short walk from the Hotel Suizo where I am staying. But visitors to Barcelona’s great cathedrals, basilicas and churches might mean that many visitors are unaware of Saint George’s Church, the Anglican church in the Sant Gervasi neighbourhood, in the north end of Barcelona. Saint George or Sant Jordi is the patron saint of Barcelona and of Catlonia, and his feastday on 23 April is a popular Catalan holiday. 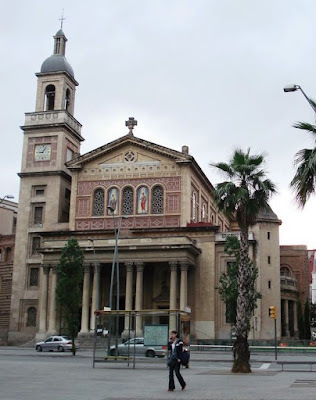 Saint George’s Anglican Church in Barcelona has a history dating back over a century and a half. Throughout Holy Week this year, Saint George’s has had a full programme beginning on Palm Sunday [20 March 2016] with a celebration of the triumphal entry of Christ into Jerusalem, and including a Maundy Thursday Eucharist and a quiet service on Good Friday. Throughout Lent, the Sunday School at Saint George’s has encouraged people to bring non-perishable breakfast foods to support the Salvation Army’s work with homeless people in Barcelona. For Easter Eve this evening [26 March 2016], the Bonanova Roman Catholic Church has invited the congregation at Saint George’s to join the “Service of Fire” at 10 p.m., starting with a fire and the lighting of the new Paschal candle, symbolising the eternal presence of Christ, light of the world. The All-Age Eucharist on Easter Day [27 March 2016] is followed by a traditional Easter egg hunt in the garden for all the children. The history of Saint George’s Church dates back to the mid-1800s when the first Anglican services in the city were held in the official residence of the British Consul. But the services were suspended in 1872 when the chaplain left for health reasons. The chaplaincy was revived in 1895 through the work of the Colonial and Continental Church Society (C&CCS), and a new British Consul-General and local British residents formed a building committee. In 1897, the committee bought land at Rosellon 250, 100 metres from where the Passeig de Gracia meets Diagonal. Building work began in 1904, all the funds were raised locally and the new church was consecrated on 7 May1905. With the Spanish Civil War, Saint George’s closed temporarily from 1936 and remained closed until the end of World War II in 1945. In 1967, the renamed Commonwealth and Continental Church Society (C&CCS), as patrons, suggested building a new, more modern church complex that could also house the chaplain, away from the city centre. Building work begin in 1971, thanks to the efforts of Richard Webb and the then chaplain, the Revd Harry Wilson, who was a good draughtsman and who designed the stained glass window that occupies one wall of the church. The new church was soon completed. The first service was held on 10 July 1972, and the new Saint George’s was consecrated on 6 May 1973. Saint George’s paid off all the costs by 1974 and became entirely self-supporting, including paying the chaplain’s stipend. New laws passed in Spain in 1992 gave full recognition to all Anglican chaplaincies in Spain as part of the Diocese of Gibraltar in Europe. Today, Saint George’s is well established, and each chaplains has brought his own special gifts to the development of the church’s mission. Each new generation adds its own fresh support to the life of Saint George’s Church in Barcelona. The chaplain, the Revd John Chapman, is originally from Scotland and was ordained in 2002. He served in Saint John’s West Ealing and Saint Hugh’s Northolt in the Diocese of London and more recently in Saint Martin’s Sharjah in the United Arab Emirates. His wife, the Revd Deborah Chapman, is American and is also ordained. They have two grown, married children. Saint George’s Church can be found at C. Horaci 38 in the Sant Gervasi neighbourhood, in the north end of Barcelona, close to Pl. Bonanova.